Select the Quick Create icon and select Invoice. Create the invoice according to how you would like it to be issued on a recurring basis. When the appropriate fields are completed, instead of selecting Save and close at the bottom, select Make recurring. 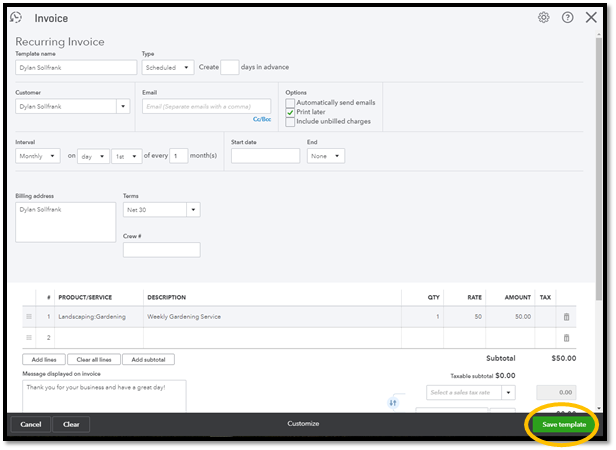 The next screen is where you create the recurring invoice template. Here is where you can name the template, identify whether it should be automatically entered, choose whether or not to have it automatically emailed, and if so, schedule when the invoice should be issued. Complete the information on this page and select Save template. If you already created an invoice but want to make it recurring, simply open the invoice and follow steps two and three.